This is a small fisherman's cottage one street back from the sea. It has a an open plan living room and dining room with kitchen off this. The bathroom is also downstairs. At the back of the house is a small toy room with door to sunny back garden where there is a table and 4 chairs. Upstairs there is a double room with small child's room leading off this which contains a cot. There is a further twin room upstairs. It is well equipped for small children with stair gates if needed, high chair and cot. There are also plenty of toddlers toys and books in the house. There are tennis rackets and 2 sets of golf clubs in the house and also 2 very basic bikes for local use. one has a child seat on it. Local town: Whitstable is a lively seaside town with plenty of popular restaurants, pubs and shops within walking distance. The shingle beach is 100 yards away and the sea gets lovely and warm when the tide comes in on sunny days. Young children can spend hours happily paddling and beach combing.There are local tennis courts and 9 hole golf course within easy walking distance. Whitstable has thriving sailing community and lively small harbour where fresh fish can be bought. The town has a small indoor swimming pool. we have equipped the house with tennis racquets and balls, 2 basic sets of golf clubs. We can also make a beach hut available on request. Wider area: Whitstable is very close to Canterbury and the historic sites of Canterbury Cathedral and St Augustine's monastry. There are many historic places to visit in the area including Dover castle, Walmer Castle and Sandwich. sport: The golf courses in Kent are varied and include Canterbury, Deal, Boughton, North Foreland and Royal St George's. There are community tennis courts within 100 m.
The local 9 hole golf course in Whitstable is within walking distance. We are retired doctors who live in the area and have 3 children and 7 grand children who live in London. We bought it to have an interest in our retirement and also so that our family and grand children can enjoy visiting Whitstable for weekends and holidays. The house is therefore well set up for under 5 year olds at moment and will change as grand children grow! House set up with toys etc for little boys! Very close to beach which children enjoy and close to restaurants etc as well. Shingle beach. Good swimming 2 hours each side of high tide. Water warms up in summer. Electric fire In sitting area. For use in house only. Please bring beach towels with you. Small Sunny back green area with table and chairs for eating out on. Local courts 100 meters away. Tennis rackets in house. Small 9 hole course within walking distance. Basic set of clubs in garden shed. this is family holiday home equipped to cope with babies and toddlers. There are a few toys and books in the house for this age group. There is a very convenient Corner store nearby which serves meals from breakfast onwards during day and sells essentials as well. Car Parking is difficult in Whitstable in the summer.Parking is available in front of the house for unloading but then after 1 hour the car needs to be moved round the corner to the adjoining street. This was a lovely cottage to stay in. Vanessa had helpfully warned us of the possible parking problems, but we found somewhere not too far away. It is a pretty and comfortable house with a nice garden . We enjoyed exploring Whitstable, Margate, Sandwich and places in between. We enjoyed our stay at 95 Island Wall despite the weather! The cottage is well-equipped and Vanessa has thought of every detail so nothing was missing. The only negatives were hit and miss wi-fi and the downstairs bathroom which was a bit of a problem for my husband in the middle of the night (steep stairs to reach it!). Apart from that all great, especially the comfortable beds and chairs. 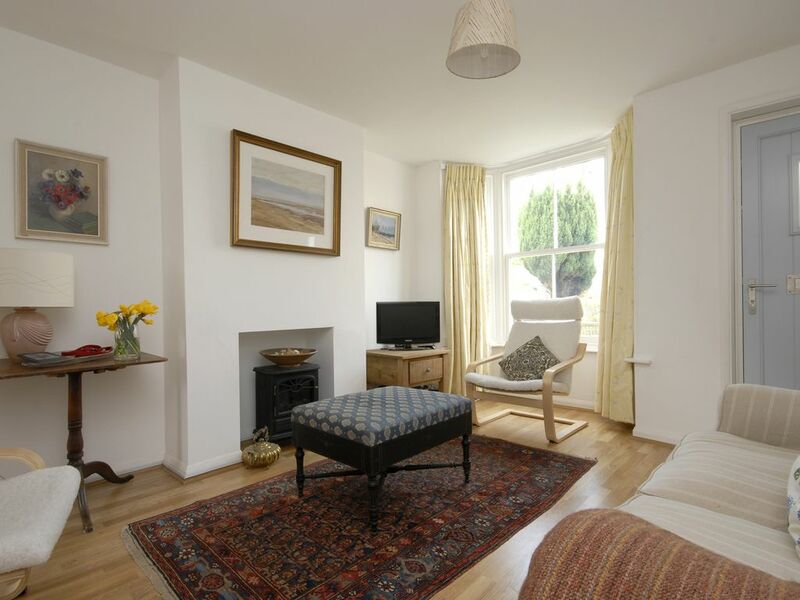 The house is located very close to the beach and to the high street, so very convenient for all amenities. There are interesting boutique shops and plenty of places to eat. We enjoyed a fabulous meal at the Crab & Winkle. It was a bit pricey but well worth it. We would like to return again some day! We loved the location of the cottage being so close to the sea. Having toys for young children was also a plus. We found the cottage to be comfortable and it was easy to find everything we needed in the kitchen. Parking is a challenge throughout Whitstable and we were forewarned by Vanessa so we just left our car in the close by carpark. It’s £1.20 per hour. It was our first time in Whitstable and we would definitely return. We loved the place. The house was in a brilliant position just one street from the beach and a short walk from The Old Neptune. The house is a home from home, and has everything for a comfortable stay. The stairs are very steep however, but that can’t be helped. We had a really nice time. The cottage was clean and well equipped- had everything we needed. Beautifully decorated and so close to the sea and town centre. Parking a bit of a challenge but that’s Whitstable!! Little corner shop “Windy Corner” close by for the essentials. Lovely property and great location. Easy access to the town with parking on the road adjacent to the property. A very nice couple own the property and helped out with local information. This is a small fisherman's cottage in the conservation area of the seaside town of Whitstable. It is one street back from the sea and within easy walking distance to the town's High Street and all its quaint shops and restaurants, such as Wheeler's Oyster Bar, the Whitstable Oyster Fishery and the Neptune Pub.It is only 100 m to the Beach. There are public tennis courts and a 9 hole golf course all within close walking distance. There are many fine golf courses in East Kent including Canterbury, North Foreland, Deal, and the Royal St George's golg club.The town is 6 miles from the historic town of Canterbury and Canterbury Cathedral and within one hour of Dover Harbour and the Channel Tunnel. The train station is a 10-15 minute walk away and it takes 1 hour 10 minutes to get to London. Golf: 9 hole golf course 300 m away. Several courses in East Kent Including Canterbury, Boughton, Deal, Kingsdown, North Foreland and Royal St George's.